Borderlinx | Buy Mango and ship worldwide with Borderlinx. Cheap rates guaranteed. The Spanish Fast Fashion brand Mango has been a favourite for a generation of young men and women loving easy and versatile clothes adapted for their lifestyle and budget. Always ahead of the latest trend, Mango is designed for fashionistas who want to change their style according to their mood. Mango aslo offers a line of clothing for kids and for curvy women. 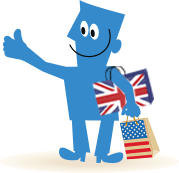 Now with Borderlinx, customers internationally can shop Mango in the UK, and Borderlinx will ship your order to your house! Cheap shipping, tax & duties are calculated upfront by our Shipping cost calculator, and additional services including concierge, free repacking and consolidation are available through Borderlinx to make international ordering from Mango hassle-free.